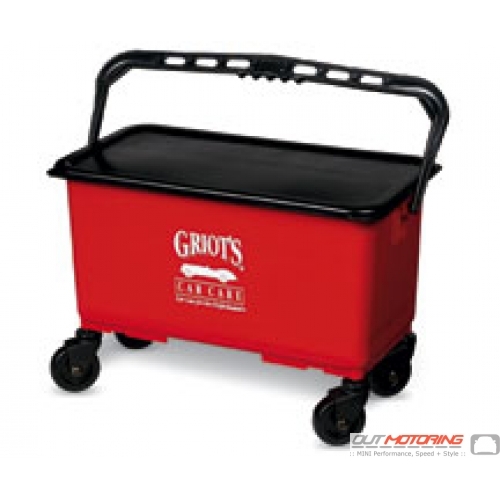 One of the best features of the Griot's Garage Ultimate Car Wash Bucket is the lower grill that allows heavy debris to fall to the bottom so your wash mitt will not pick it up again. There is also a molded-in measuring cup in the grill for you to dispense the proper amount of Car Wash each and every time. No more guessing, no more wasting product. There is also a top sieve so that your wash mitt can lay fully on it without dripping over the side of the bucket. There are optional 2" casters so you can push the bucket around with your foot if your hands are full. The heavy-duty molded plastic tub holds a massive six gallons of water, has a wonderful form-fitting handle, and has measurements in liters or gallons on the inside wall. The bucket is 19" wide, 9" across, and a generous 9" deep. The snap-on lid keeps the water from splashing during transportation to the wash site or seals out dust when storing your washing supplies.